Denise Weimer honors us with her presence this week. She is a hybrid author of historical and contemporary time-slip romantic suspense. Denise loves to write dual time-period stories where modern characters learn life lessons as they uncover a mystery from history. Denise holds a journalism degree with a minor in history from Asbury University. A former magazine writer, she works as a substantive editor for Lighthouse Publishing of the Carolinas. She has authored The Georgia Gold Series, The Restoration Trilogy and a number of romantic novellas. 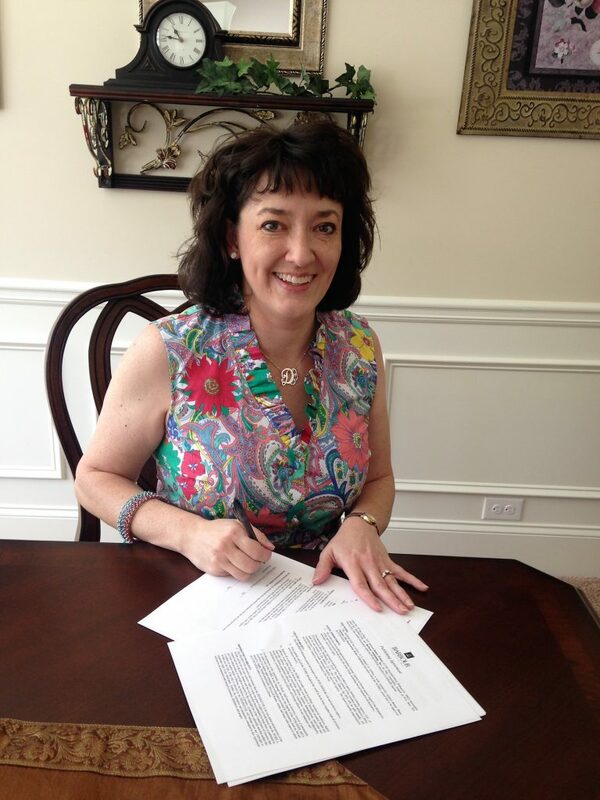 She is represented by Hartline Literary Agency. A wife and swim mom of two daughters. Denise always pauses for old houses, coffee, and chocolate! Denise is offering a giveaway via Rafflecopter that will run the month of May. Just click here and scroll down to Denise Weimer. Choose to sign up under your Facebook or Twitter account. And you’re entered. My life before writing consisted of 11 years. As an only child born near Atlanta, Georgia, I traveled with my parents to historic sites. I sat in the back seat and scribbled stories into spiral-bound notebooks about the people who might have lived there. My mother listened to every word and encouraged me to keep writing. By the time I graduated with a journalism degree and minor in history, I had a Civil War-era trilogy ready to go. In those days, I was able to approach publishers directly, without an agent or prior publishing experience. So I concentrated on my public relations job, independent editing, and layout as we started a family. God removed my pressing desire to write so I could focus on our two baby girls. When my younger daughter took naps, I wrote a novella. Redeeming Grace’s publisher set the price so high I LOST money when I placed it in a store. That venture looked like a failure. But it led to an introduction to John Kollock, a prominent regional artist who lent me his family letters and diaries . His endorsement and cover art opened doors for my Georgia Gold Series (historical romance with a touch of mystery, set from the Georgia Gold Rush through Reconstruction). The publisher for that series went under just as book one released. A dreadful and embarrassing situation and six months of hemorrhaging money as I attempted to keep book one, Sautee Shadows, afloat, led me to put my writing on the altar. I was willing to do something different if God wanted. After a move and another year, I found another traditional, independent publisher, Canterbury House. This time, things went smoothly! I followed Georgia Gold with The Restoration Trilogy, time slip romantic suspense. The modern characters uncover stories from three different centuries as they restore a historic property. But someone does not want them at work. While promoting Restoration Trilogy, I learned the importance of networking with readers via social media and other authors via blogging. 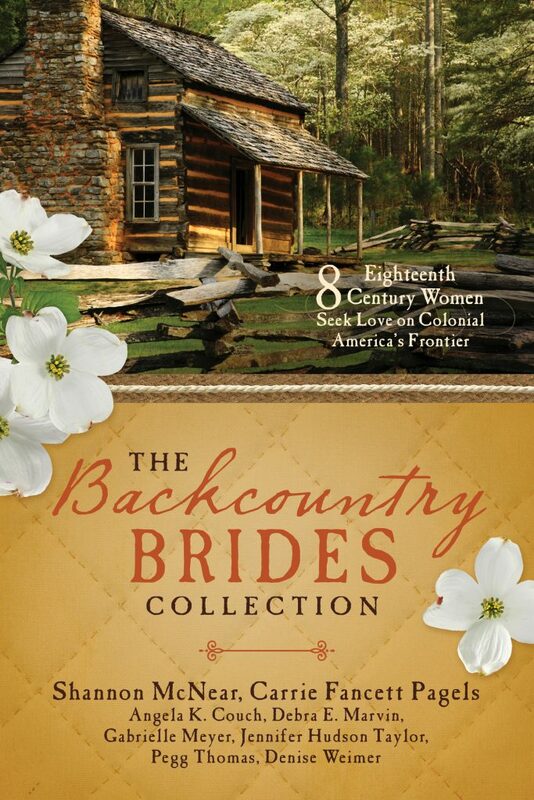 My dear friends at Colonial Quills blog invited me to join them in the Backcountry Brides collection. The eight Colonial romances in one volume release this month with Barbour Publishing. My heart-pounding story, Across Three Autumns, features a strong heroine who doesn’t think she’s worthy of love. However, the swoon-worthy Scottish scout might be stubborn enough to convince her otherwise. I have several stories out to publishers via my agent. I pray they’ll invest in an emerging author! I’m also helping out with editing at Lighthouse Publishing. Being an editor was always a secondary dream, a package deal with being an author. The latest collection, the agent, and the editing position all came about thanks to my Colonial Quills connections. 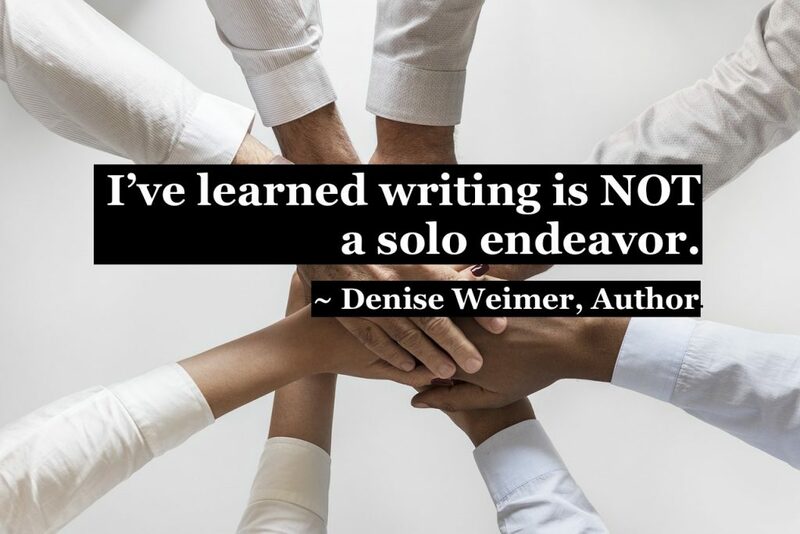 I’ve learned writing is NOT a solo endeavor. In the community of faith, we all need each other. So thank you, Linda, for hosting me today! And thank you, readers, for stopping by. On our recent 25th!! 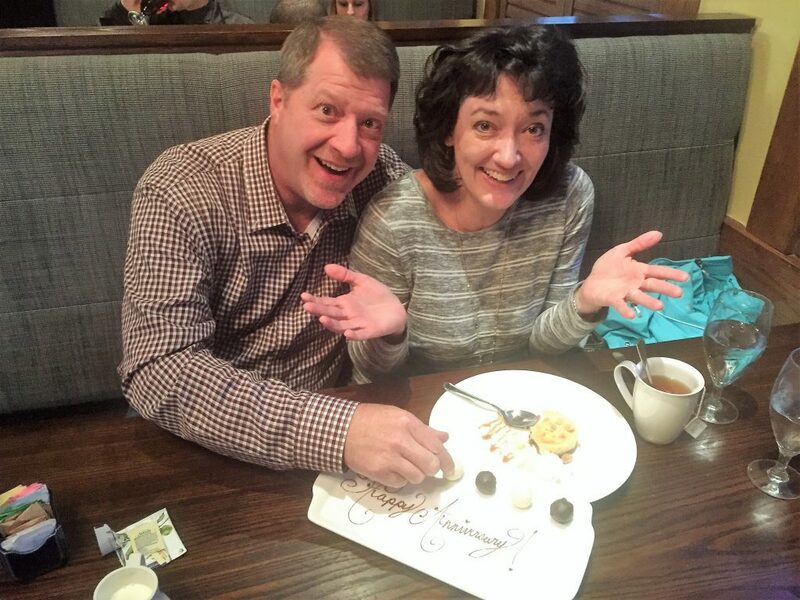 anniversary (I was a child bride), I enjoyed three favorites—hot tea, cheesecake, and truffles. But I had to fight off husband Wayne. Guess who won? 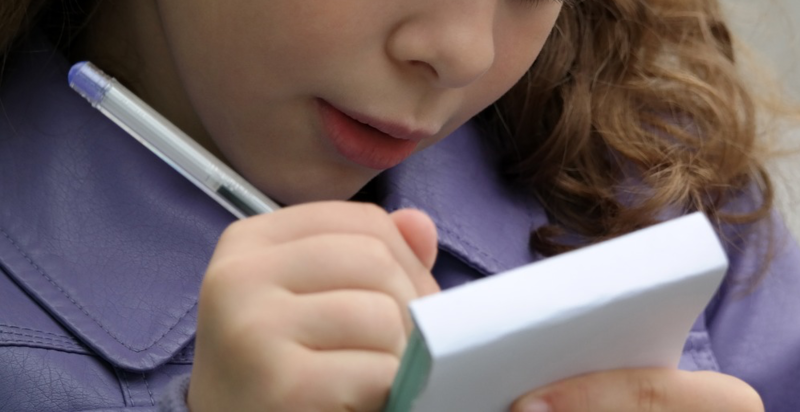 How fascinating, Lord, the myriad ways You call writers to pen Your stories. Then You bring them together as community in support of one another. You’ve written Your history on the hearts of writers like Denise whose passion is sharing Your story. We treasure books like hers that tell of Your goodness through all generations. We pray You’ll bless each word Denise writes for You. Exactly my words! I am writing in the same genre. So excited, to meet someone, who thinks the same way! Hi, Tanja, glad to “meet” you! I’d love to connect via FB and Twitter! Hi, Tanja! Seeing your name put a big smile on my face. Thank you for stopping by. Nice interview with Denise Weimer. It’s always nice to learn more about an author. Denise, your variety of genres sound like wonderful read. The Backcountry Bride Collection is one collection I defnitely want to read. Hi, friend. I ditto your comments about Denise’s books. And wish you and yours a beautiful Memorial Day weekend too. Thank you for joining in. Hi, Marilyn, thank you for stopping by. At one point I thought I’d only ever write historicals, but sometimes unexpected opportunities force us to try something new! I’ve found that writing contemporary stories has helped tighten my future historical writing. Thanks, Andrea! Glad you liked Caylan. He seemed so real when I was writing his parts! Very nice interview. I like getting to know authors better. I liked your swoon-worthy Scotsman! Hi, Andrea. Welcome to our circle. Your comments have encouraged Denise and me both. Please stop by again. Thanks for the interview. I’m sure being an author is not for the faint at heart! I thoroughly enjoyed The Backcountry Brides which I would say has been very successful. I’m looking forward to seeing what’s up next for Denise. Hi, Perianne. Seeing your name in Comments always makes me smile. So glad you could stop by for our chat. Ditto to your remarks about Backcountry Brides and what’s coming up next for Denise. Thanks Linda and Denise. I’m reading Backcountry Brides now. I’ll keep Denise on my radar! Thank you, Paula! I was so happy to “meet” you at the Heroic Women FB party this week. I hope you enjoy the novellas. Hi, Paula. It’s delightful to see you in our circle this week. You’ve encouraged us! Thank you.